Before I left Scammon Bay, all of our students K-12 signed and decorated a Styrofoam cup. I carefully packed these cups and brought them onboard the Norseman II in order to send them to the bottom of the Bay with the ROV Kraken on one of its nighttime dives. So, last night was the night for the deepest dive! I stuffed paper towels into each cup and dropped them into a mesh bag. The ROV crew tied the bag of cups to the frame and down, down, down they went! About 6:30 the next morning, I hurriedly went up to check on our cups. Wow! All the cups were miniatures! The water pressure had compressed the air from the Styrofoam as the ROV had descended and the cups shrank! Now all the students of Scammon Bay have a souvenir from the bottom of Glacier Bay! What a neat object lesson these little cups will be for all the kids at school. I hope it will be something they’ll never forget. In addition to my excitement about my student’s cups, the scientists were excited about the samples brought up from the dive. A big Red Tree Coral sample was lying on deck. By its name you would think the coral is red. But it’s not. It’s kind of pinkish orange sherbet colored. It does look like a tree, though. The bottom of it looks like a young tree trunk. And it has rings like tree rings! According to Chief Scientist Rhian Waller, unlike tree growth rings, the rings aren’t indicative of yearly growth, but of growth due to abundance of food and living conditions. Today, we steamed back toward Bartlett Cove. Bartlett Cove is the headquarters for the Glacier Bay National Park Rangers and the little town nearby is Gustavus. Gustavus has a population of 350 and the school has about 70 students. When we arrived in port, a sea otter greeted us, just hanging out. Eating while he floated on his back. He was noisily, crunching and smacking. Sea otters typically eat urchins, clams, and mussels. At one point he crawled out onto the dock to sun himself. While in port, we had “open-ship” tours for the community of Gustavus. Scientists and ship’s crew took groups of ten through the Norseman II showing equipment, samples and answered questions. We were thrilled that about 65 people, including children with parents and grandparents, turned out and enjoyed learning about scientific research conducted in their Bay! I rode into the little town of Gustavus with Ranger Sarah to drop Scientist Bob Stone off at the airstrip. Sarah drove us around on a tour. Gustavus is a beautiful little town with a gorgeous view of the Fairweather Mountain Range. 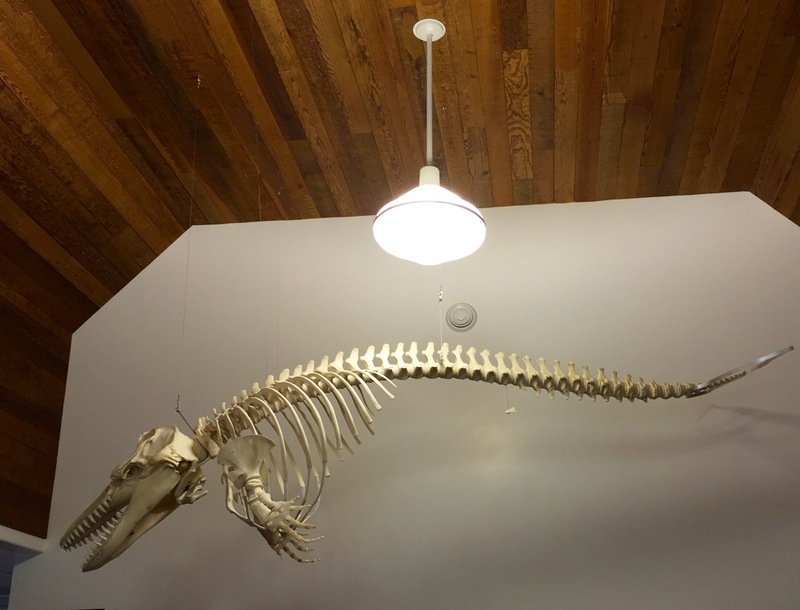 One super cool thing that you can see in the Gustavus Public Library: an Orca skeleton hanging from the ceiling! Orca whales stay in Glacier Bay year round. After the ship tours, the Park Rangers took us on a short walking tour around the visitor’s center. The National Park Service is partnering with the local Tlingit tribes in making this location once again a gathering place for them. They are building totem poles and a tribal meetinghouse designed by the tribal elders. We learned that the Tlingit tribe lived in the area before the Bay was formed. It wasn’t yet a Bay because it was still covered in a giant glacier. The Tlingit still have songs and stories that tell of the glacier moving as fast as a dog running! So they hurriedly got in their canoes and fled to safety. As the glacier surged it destroyed their homes and scoured the land. They re-settled into places like nearby Hoonah, a native village across the way. Before we left Bartlett Cove, everyone gathered with Qanuk and I on the dock sign for a photo with the winning banner designed by Scammon Bay 4th graders! Now we’re all back on the ship and heading out to open waters. 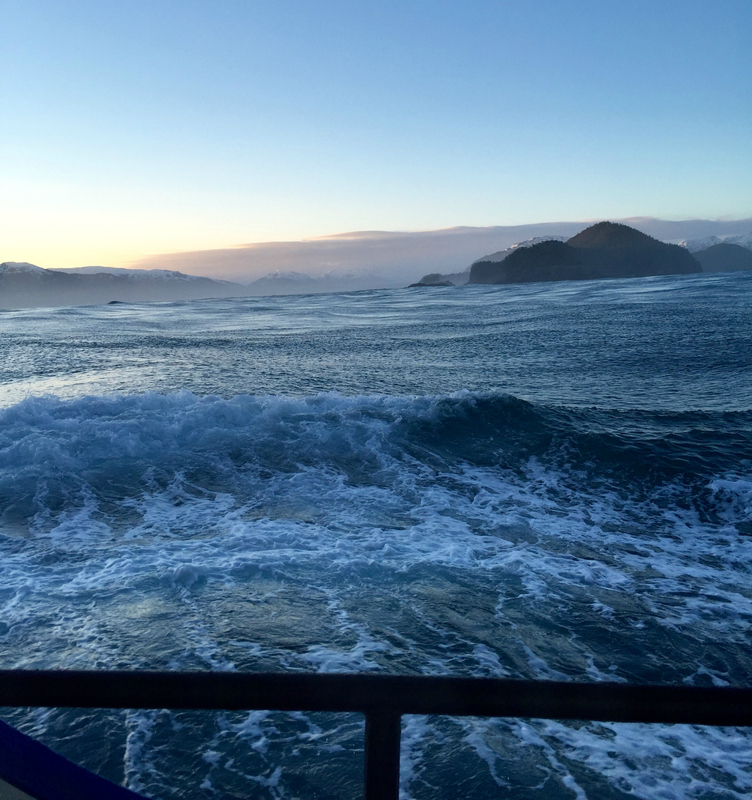 The glassy waters of the Bay are gone and it’s looking like a rough ride. Since the ship’s work is ongoing 24-7, it seems that one day runs into the next because someone is always up and at work. And someone is always asleep in the stateroom. I’m amazed at how smoothly things work. Everyone pulls together to help each other and get the work done. If you think about it, there are LOTS of things going on. For example, the meals must be prepared and dishes washed. The science work must be done—scuba diving and processing during the day and ROV diving at night. The ship must be piloted and navigation is critical at all times. General housekeeping is always going on. It’s all an impressive operation and I’m happy to be here and hopefully a productive part of the team! 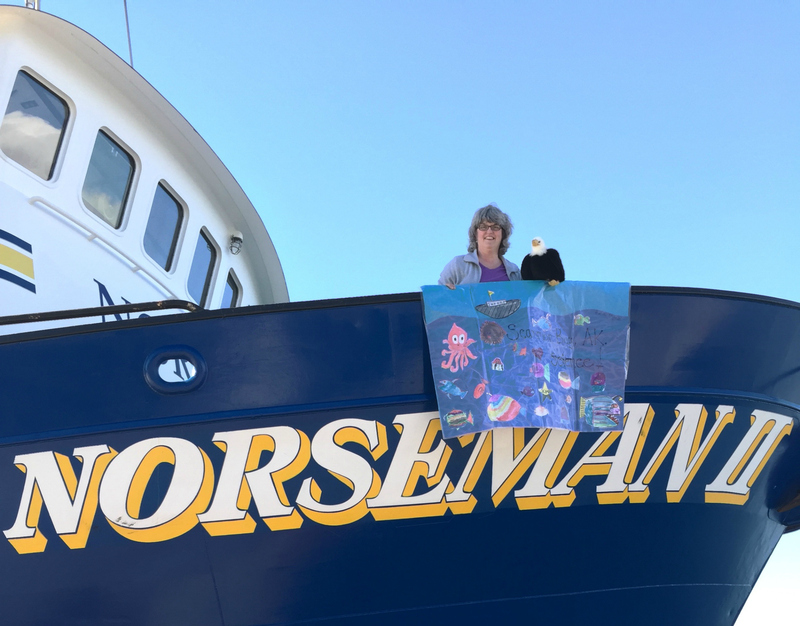 This entry was posted in 2016, Mary Cook 2016, NOAA Teacher at Sea and tagged Alaska, coral, Mary Cook, Norseman II. Bookmark the permalink. Hello Mary! 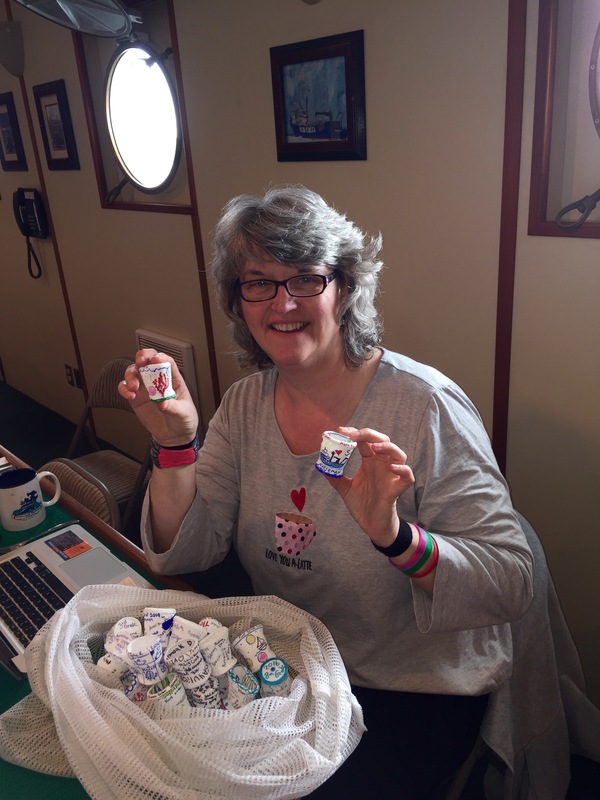 This is Julia, 2015 teacher at sea – we met in Scammon Bay on the day you left. I was there to ski with the kids for the week. I have finally gotten a chance to look over your blog, and it’s awesome what you and the team are doing. I especially loved seeing the faces of our Scammon Bay kids, who I grew to love over the course of the week we were there. I am going to share your blog with my science students – perhaps they’ll have questions for you. Please say hello to the kids for me when you get back! I miss them already; I hope to be back next year!